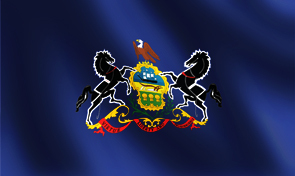 An intricate state seal centered on a field of blue, the Pennsylvania state flag shows the value of commerce, natural resources, fertility, peace, and prosperity. Above the shield is an American Eagle, signifying the state's loyalty to the United States. The state motto, "Virtue, Liberty, and Independence," is written below the seal on a red ribbon. This flag was officially adopted in 1907, and has been flown proudly ever since.